Discussion in 'Adapted Lens Sample Image Showcase' started by lesioc, Oct 26, 2010. Some photos taken with my c-mount (1") CCTV lens from Fujion. Therefore I change the name of the thread to "Fujian" - but I am not 100% sure jet . What is the body this picture was taken with? I use Lumix G1 mainly, ane vignetting is always noticeable (when no macro rings are used). I found some other photos that are marked "Fujian" (or FEiHUA that I belive is name of the manufacturer of the brand "Fujian") and look very similar to mine. For example here: Manual Focus Lenses :: View topic - FEiHUA (F&H) 25mm F/1.4 CCTV lens (it seems to be taken with Lumix G1 too). Do you have a photo of your lens? I will try to make a photo of mine later and put it here to clarify this. I was about to upload a picture when I realised the difference to the one shown in the Flickr link. I have the 35mm one mentioned there too. There are no markings on it that indicate fujian or otherwise. the lens has a really nice quality to it. I especially like the one of the parked cars. The first one is probably my favorite picture I've taken with this lens. With an E-PL2. Thanks for the good post, I just ordered a polished colored one and hope to get awesome results like you. This is lens I really have a lot of fun with. It's very light and really easy to use if you can remember the focus ring is near the camera, not then end of the lens. It's sharp in the center, even wide open, and has that "lomo" bokeh that gives me vertigo... but in a good way! The Fujinan 25mm f/1.4 is NOT a particularly inexpensive lens (prob. > $100 on eBay if you can find one), but is an excellent piece of glass. It's a high-end CCTV lens, made in Japan by the same company that makes Fuji cameras. I managed to score a used one, and it's very nice, though it vignettes too. Its bokeh is more 'conventional', which some may like and some may not. 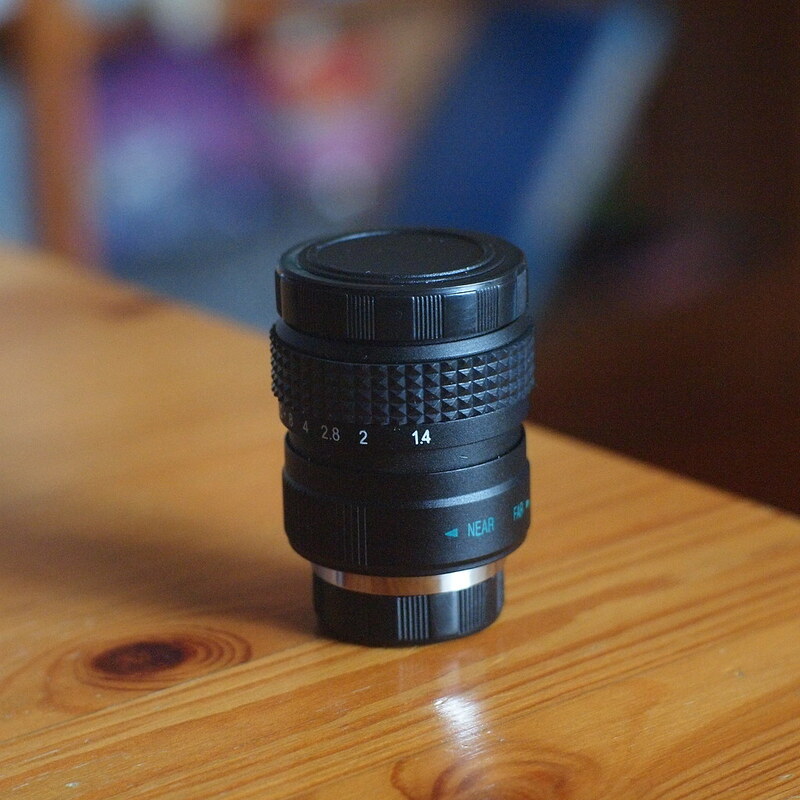 The Fujian lenses (25mm f/1.4 and 35mm f/1.7) are made in China and ARE very inexpensive lenses (about $30 new for either on eBay). I haven't used either, but I have a 35mm on order--slow shipping from China! These appear to have the swirly bokeh seen on some of the photos in this thread. The second one shows that the lens is actually pretty sharp across the frame (compare the center to the bottom and right corner). Mellow, do you mean fujinon lenses? I cannot find any references to fujinan lenses op ebay or google.. There are fujinon lenses on ebay though around $100.. Sounds really interesting though, and you pictures look really great! spelling . . . ! My mistake, it should have been Fujinon, you're right. im thinking of buying one (Fujian $30-40ish on ebay), what focal length do you suggest since i already have the lumix 20.. I just got the Fujian version yesterday. Here is my first shot with it. The vignetting looks worse on the LCD then it did on the photo when I looked at it on my iPad. I got the 35mm also. It is a fun little lens, GH1 with the inexpensive 25mm 1.4 wide open. The focus ring being next to the body always throws me for a loop also.